The peak oil and climate change imperatives raise real questions about how we can develop alternative sources of energy quickly and to scale. We don’t have the definitive answer as yet, but there are plenty of opportunities if we look to what we already have. Some surprising and innovative ways to generate electricity are likely on the horizon, and some have already arrived. 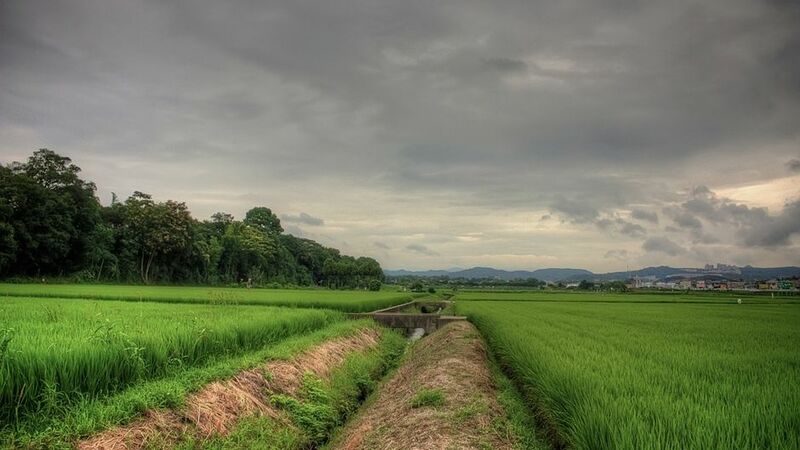 An agricultural cooperative in Japan’s Tochigi Prefecture has been benefiting from electricity produced by hydropower stations installed in their rice irrigation water since 2006. The Nasunogahara Land-use Improvement Union’s (NLIU) Momura No. 1 and Momura No. 2 devices generate 30kW and 90kW respectively. According to the international practice of dividing hydropower into different categories, based on the amount of energy generated, the devices are “micro hydro” since their ouput is less than 100 kW. The other classes are: large hydropower (generating more than 100 megawatts of electricity), small hydropower (up to 10 mW) and mini hydropower (around 1 mW). The Momura micro hydropower is an early example of generating electricity by using irrigation water, which has most often been for growing rice. Growing rice is a water-intensive business. For most of Japan’s rice fields, water is brought in through human-made irrigation systems that source water from local lakes and rivers. In the Nasunogahara case, the kinetic energy generated by height gaps in the human-made channels (i.e., gravity) is sufficient to supply power for the NLIU’s irrigation facilities, which would have otherwise used electricity from the grid. Localised electricity production is efficient as it generates electricity at the site of consumption, without using large amounts of energy connecting to, and then being distributed from the transmission grid. More importantly, by using renewable energy sources, CO2 emissions from electricity generation become negligible. Small hydropower generators are expected to cause less environmental damage to local ecosystems, compared to large-scale hydropower stations for example. In addition, long-term financial benefits can be expected. In the NLIU case, the four generators cost approximately ¥100 million (US $12 million) in total, including equipment and installation. The exact cost-effectiveness is yet to be calculated, but the NLIU expects a long-term return on investment in about 10 years. This will be had through savings gained by offsetting electricity purchased from the grid with self-power generation. Land-use Improvement Unions in Japan were created under the Land Improvement Act in 1949 to promote the “modernisation” of rice field arrangements. The unions have exclusive rights to use irrigation water for growing crops. Though it is not uncommon for agricultural cooperatives to develop or own hydropower facilities, most hydropower facilities were developed a few decades ago on relatively big river streams. However, in the context of increasingly unstable oil prices, some of the Unions are now starting to expand their water rights to generate electricity from irrigation channels. In Tochigi, NLIU receives overall support from various organisations including the local government, but it is mainly a venture of the Union to take up the initiative. As a result, the Nasu case has drawn a lot of attention from other communities that are looking into new forms of electricity provision. Further unexpected support is coming from an old rival — Japan’s powerful regional electric utilities. Despite privatisation, which took place from the 1990’s, Japan’s 10 regional electricity utilities still control over 90% of electricity supply. Nonetheless, Tokyo Hatsuden, a consultancy under the umbrella of the Tokyo Electricity Power Company, is working closely with NLIU to develop more micro hydropower stations. This signals a new trend where cooperative relationships are developing between giant utilities and small-scale electricity generators. On the other hand, a lack of awareness among policy makers, together with overly restrictive regulations for agricultural water usage, is currently making smaller hydropower generation commercially unattractive. The Japanese feed-in tariff (FIT) system for photovoltaics, which came into force in November, excludes hydro-power and other renewables, and will make the payback time shorter for solar energy in comparison. “There would be more and more cases like Nasu where micro hydro devices are placed in irrigation water, if appropriate policies are there to support them,” says Mr. Nakajima, the managing director of the Japanese Association for Water Energy Recovery (J-WatER). Irrigation water has huge potential for hydropower application, especially given its availability in most regions of Japan. It is estimated that it can supply more than 1.2 terawatts (1,000,000 MW) of electricity a year if its potential is fully tapped. At present, J-WatER has over 75 such micro and mini-hydro schemes registered in its database covering the whole of Japan with an installed capacity of 22,800 kW. Countries like Japan may not have large fossil fuel reserves, but what about alternatives? There are more and more innovations that could be developed, particularly at the local level, if we seriously focus on what energy we already waste in the system. For their further development of micro hydro and other source of renewable energy, it is impossible to over-emphasize the importance of appropriate policy. How Things Work: Micro Hydroelectricity in Japan by Aki Suwa is licensed under a Creative Commons Attribution-NonCommercial-ShareAlike 3.0 Unported License. Aki Suwa is a Research Fellow at United Nations University Institute of Advanced Studies and holds a Master’s degree in environmental technology from the Imperial College, University of London, and a PhD in Planning Studies from University College London. Her general interests include social and economic implications of renewable energy development, and interactions between ecological conservation and renewable energy dissemination, with most of her past work being related to renewable policy analysis. Let’s Generate Electricity by Walking!